“As a yoga teacher myself I’m proud to call Jeff one of my teachers. He is so skilled and embodied in offering a complete and expansive practice, whatever your level. Whether it’s his wonderful weekly yoga classes or his immersive and blissful yoga retreats you are guaranteed a thorough and uplifting Yoga experience"
"I have been taught by Jeff regularly for some time now and having experienced many different yoga teachers and styles I can honestly say that he is one of the best that I have come across in nearly 20 years of yoga practice. Every yoga class is different and yet they each seem to tap into exactly how I am feeling and provide me with what I am needing from my practice on any given day. Jeff''s teaching is intuitive, warm, friendly, supportive and most of all inspiring". 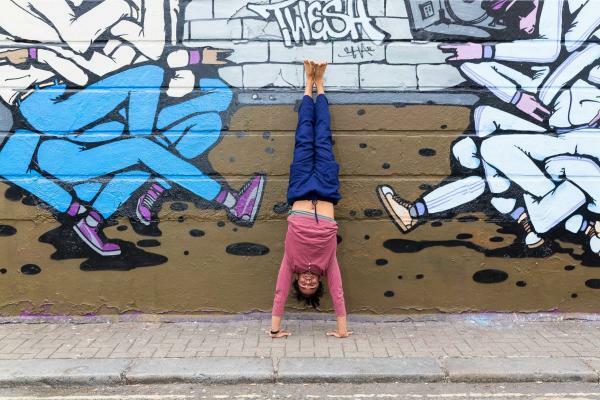 "I always walk away from your yoga classes feeling that this is what yoga is all about - I feel the stresses of the work week & worries, float away, my body & mind feeling calm & I feel like I've had a great work out of my body & mind". "I've tried many yoga teachers over the years and Jeff is undoubtedly one of my absolute favourites. He has an acute attention to detail when it comes to the postures and he is great at educating the class on the philosophy behind yoga. 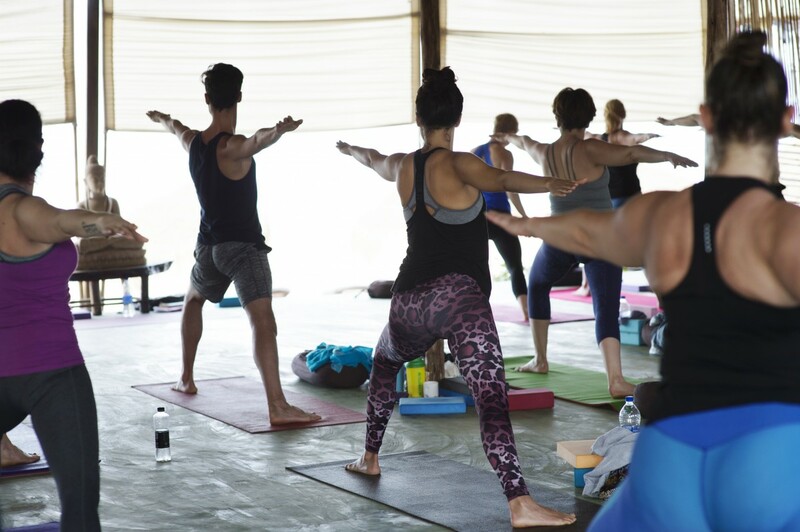 He is able to create a great atmosphere on his yoga retreats, as he encourages and challenges people at the right pace, whilst keeping it light-hearted and focused''. "Thanks for the amazing yoga class yesterday Jeff, you are such an inspiration & I feel so blessed to have you as a teacher. Thanks for enlighten my practice and help me to stay connected to that place within my heart "
"Despite taking up yoga as a way of improving flexibility what I have gained from it is so much more. Your yoga classes always brought a sense of balance to an otherwise hectic life and the reason I kept coming back was that I always felt a sense of clam and peace after each class. Every yoga class had a great mixture of physical and mental challenge and a sense of play and fun which I really appreciated". "Your yoga workshop completely re-energised me and elevated my sence of awareness to one that i hadn't experienced before. I left feeling on top of the world, ready to face anything and believing all is possible!" "Deciding to go to India for the first time, on my own to a yoga retreat where I didn't know anyone else turned out to be one of the best decisions I ever made! My week on a yoga retreat iwith you really was one of the best experiences of my life. I escaped my routine, met and talked to like-minded yogis who were all so welcoming and open and really went deep into my own practice. Not only did it reaffirm my love for yoga but reminded me how important it is to take time out for myself. " "Jeff I didn't make it to your yoga workshop today, but I have just practised to this in my living room and I just wanted to say how grateful I am to be able to be your pupil both physically and virtually". "Great yoga class, your teaching is so precise, and easy to follow, and has left me feeling alive, and so relaxed at the same time". "Jeff's yoga retreat exceeded all my expectations! Fantastic yoga teacher, beautiful surroundings, great company, and delicious food. Jeff guided everyone to work to their own limits with complete ease, taking us on on our own personal journey. The daily meditation and yoga classes felt so nourishing for the soul, and allowed time for self care and inner peace. Jeff’s knowledge and warm energy is inspiring and humbling - I learnt so much within the week and left feeling completely restored and energised! If you need a break from you life routine and want to explore your yoga practice I couldn’t recommend Jeff’s yoga retreats more!" "I have done many yoga retreats over the years but yours has definitley been one of the best. The setting was stunning, the accommodation showed attention to detail, the food was mouth-wateringly delicious, the company was interesting and fun. As for the yoga, it was outstanding because it was challenging yet encouraging and altogether insightful. I look forward to joining you for more yoga adventures...soon!" "I would love to come again next year, this was the best holiday of my life!" "Your yoga workshop gave me a total awakening of my body, my mind and my spirit. The asana practice, which included a deep flowing vinyasa, was beautifully arranged and paced such that you were able to fully immerse yourself in the practice,which in turn completely re-energised my entire being and elevated my sense of awareness to one which I had never experienced before. The restorative section provided me with a whole new set of experiences in much loved and familiar asanas and the deep meditation left me feeling on top of the world, ready to face anything and believing that all was possible. Everyday should be spent feeling how your workshop left me feeling"! "As one of the world’s worst meditators I can honestly say that I have got closer to that point of profound silence in Jeff’s workshop than I have with the many yoga teachers of India with whom I have studied. He is the genuine article – a gifted teacher deeply commitmed to the ancient yoga teachings. He wants to infect everyone with his enthusiasm, but he is very cool and never stuffs it down your throat". 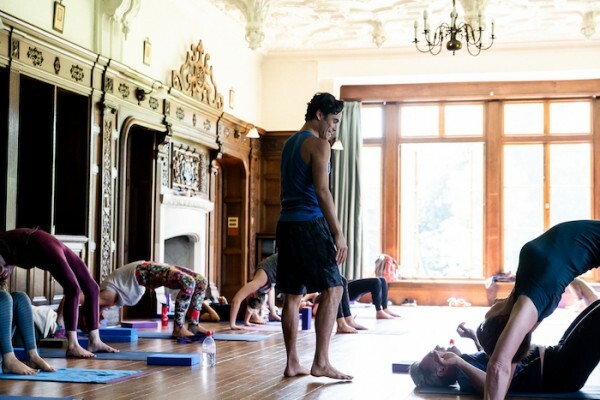 "I thoroughly enjoyed the Yoga Weekend at St Katherine's House. It is a beautiful venue, perfect for a Yoga weekend. Jeff is so enthusiastic and encouraging, I am a complete beginner and have gained a great deal from the weekend, I am now inspired to find a local class as I can see how beneficial yoga is to body and mind. I loved Jeff's relaxation and meditation sessions." 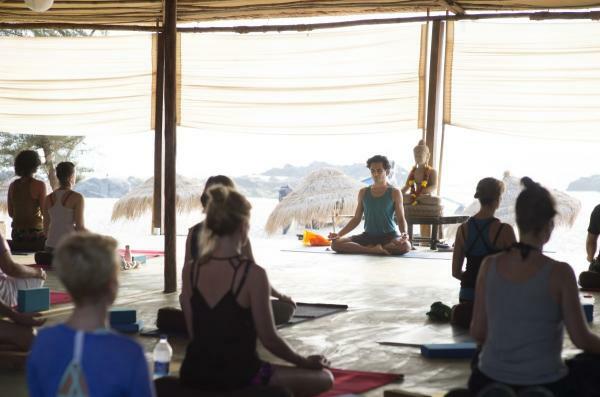 “This was my first yoga retreat and I have a feeling it set the bar high! The venue was a charming Victorian mansion in the middle of lovely English countryside. 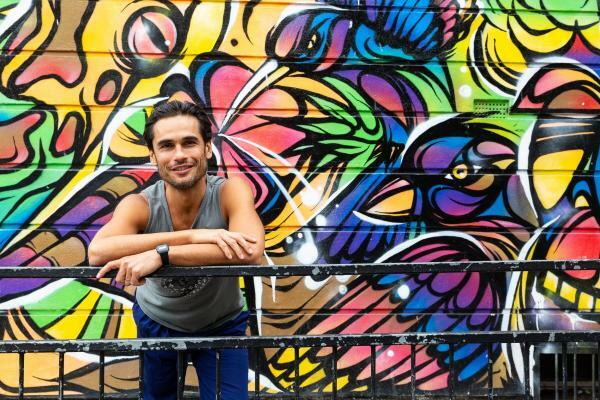 Jeff is an excellent, charismatic yoga teacher with a humorous yet very professional approach. We practiced yoga in a spacious, bright former chapel, it was a fun mixed group and completed last but not least by very delicious homemade vegetarian food and superb organisation!" "Thanks so much for such a great yoga retreat in Italy, it was just what I needed. I have felt very clear headed and a lot calmer since. I loved all the meditation and the asana practice too. I feel so much better physically and mentally from the weekend’s practices. Plus amazing food and group of people. I loved it". "Just wanted to say a huuuuuge thank you for an amazing yoga weekend, it was really fantastic in every aspect. I absolutely loved the yoga of course, and well done for meeting everyone's needs as there was a mixture of levels. I loved that there was so much meditation and pranayama, and feel inspired to keep some of that up. Awesome venue, delicious and plentiful food, I really enjoyed it"! 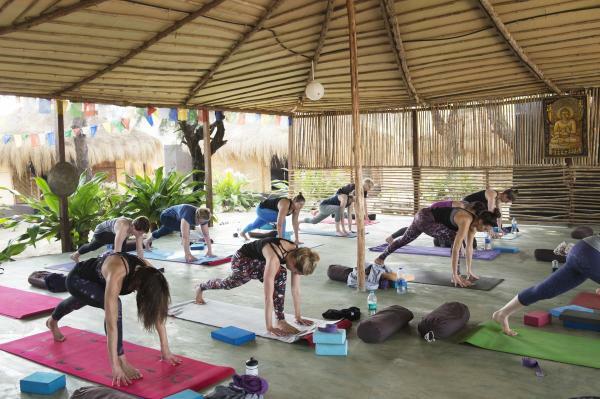 "The Bamboo Yoga Retreat is really wonderful. It's very simple and comfortable. I've been to India many times and this place is really the best beach experience. The staff keep everything meticulously clean and are so friendly - such a relaxed atmosphere. And last but not by any means least the food is exceptional". "Thank you for a wonderful week at Bamboo Yoga Retreat. I thought i might not be able to keep up, of course at times I didn’t, but you make it so acceptable to take the easier options, that it gave me an opportunity to really listen to my body and not feel I had to push it. Apart from being a lovely person you are a gifted teacher and i am in awe!" "Jeff's yoga retreats are spectacularly good! Such amazing value for the very best yoga, venues, food and people. We just got back from Jeff's retreat and have had the most restorative and fun time. Jeff is a superb teacher, for all levels. He makes everyone feel comfortable and confident to be themselves, to try, to explore and to ultimately find some peace and clarity. If you can, do go! You'll be amazed at how good you feel for it." "Thank you for an amazing yoga retreat. I came here a bit of a wreak but now am leaving brimming with energy and ready to take on the world!" "Thanks for a wonderful yoga retreat. Jeff, as ever you always lead a fabulous practice providing inspiring sequences with your usual playful approach". "You are an amazing yoga teacher Jeff. I just experienced the most inspirational, creative, vibrant and deeply transformational yoga retreat with you. I feel wonderful, energised and inspired on my yoga journey; to go more deeply into my own practice and experiment with my teaching with renewed confidence"
"Thank you so much for an authentic, well paced (for everyone) and expertly delivered yoga retreat. You bring a huge depth of yoga experience to your teaching and offer it up with humour and heart. I have found my still, peaceful, inner space again. Thank you!" "I'm so glad I came. You dealt so beautifully and easily with all our different abilities - really gentle, accepting, just enough challenge and encouragement,spirituality and depth, humour and lightness - and some brilliant tips too that I've never heard before, real "lightbulb moment" stuff!!"